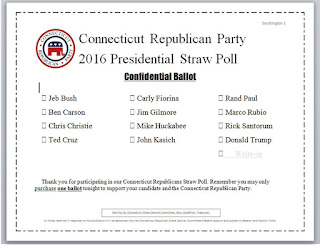 CT GOP is holding a Presidential Straw Poll on Friday, January 15th all around the state. The 13th district will join the 16th district location at King 33, 75 Aircraft Road, Southington at 7 pm. Light refreshments will be served. Proceeds will benefit CT GOP National campaign account. I highly encourage all to attend and help make this a successful event. The results will be published and will show where Connecticut Republicans stand when it comes to the presidential candidates. Please share this with your friends and encourage each to participate.